New England Patriots owner Robert Kraft, who was charged last month with two counts of soliciting prostitution at a day spa in Jupiter, Florida, has broken his silence on the matter. 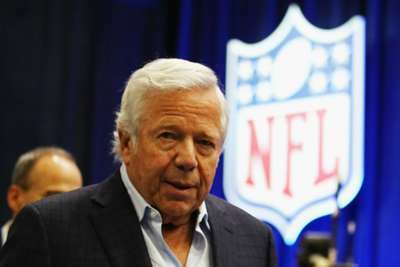 In a widely reported statement, Kraft expressed remorse and described his "extraordinary respect for women". Kraft, 77, was one of 25 men to be charged with paying for sexual services after an investigation by police into human trafficking. Kraft has pleaded not guilty. "In deference to the judicial process, I have remained silent these past several weeks," Kraft said. "To correct some of the misinformation surrounding this matter, my attorney made his first public comments on Friday night. I would like to use this opportunity to say something that I have wanted to say for four weeks. "Throughout my life, I have always tried to do the right thing. The last thing I would ever want to do is disrespect another human being. "I have extraordinary respect for women; my morals and my soul were shaped by the most wonderful woman [his late wife, Myra, who died in 2011], the love of my life, who I was blessed to have as my partner for 50 years. Kraft's attorney has professed his client's innocence and on Friday told ESPN the evidence against Kraft was gathered illegally. Michael Edmondson, a spokesman for the state attorney in Palm Beach County, was quoted as saying it would not "be appropriate to comment on an open case." The Patriots owner reportedly rejected a plea deal that would have seen him serve 100 hours of community service, pay $10,000 in fines and attend a class on the negative effects of prostitution in exchange for admitting he would be found guilty of the charges in court. Kraft faces an arraignment hearing on March 28.